Coinbase Pro is an advanced cryptocurrency trading platform owned and operated by Coinbase. Launched in early 2015 as Coinbase Exchange, it benefits from many of the same advantages held by Coinbase itself, including ease of use, solid security measures, and good liquidity. That said, it is focused on experienced, high-volume traders and therefore allows a range of advanced trades, from stop and limit orders to good ‘til cancelled and fill or kill orders. 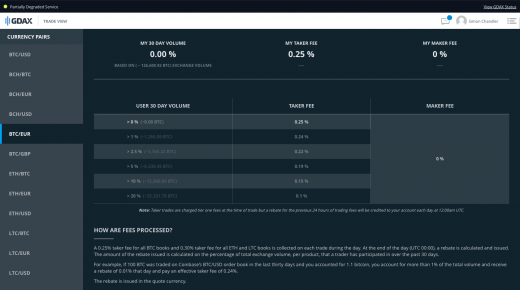 Its trading fees are competitively low, while it doesn’t charge anything for cryptocurrency deposits or withdrawals. This makes it a very good exchange overall, even if its customer support can be slow, and even though it supports only four cryptocurrencies and doesn’t allow margin trading. Fees are impressively low on Coinbase Pro, although they’re cheaper with bitcoin trades than with trades in either ether or litecoin. For those who put a new order on the books when buying or selling (i.e. “makers”), there’s no trading fee whatsoever, and this applies for all cryptocurrencies. Together with the free cryptocurrency withdrawals, these flat fees mean that Coinbase Pro is one of the cheapest exchanges currently in operation. 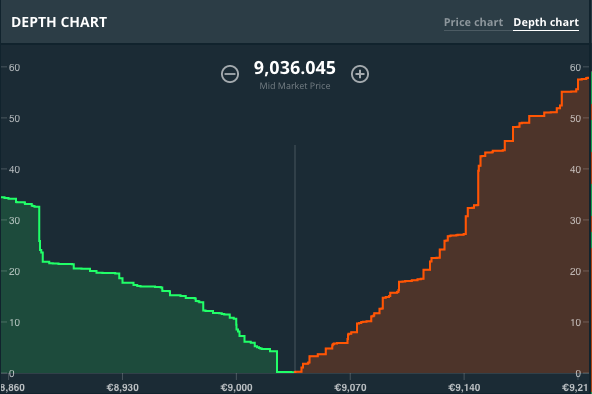 For instance, Bitfinex charges 0.1% of any bank transfer in euros, which would mean that someone wanting to withdraw €10,000 would have to pay €10, whereas a Coinbase Pro customer pays only €0.15. 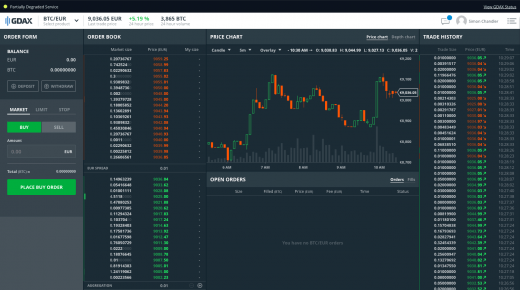 Launched in January 2015 and owned by the same company that operates Coinbase, Coinbase Pro is geared more towards professional traders than its more accessible stablemate. It allows for a variety of order types, ranging from the obvious limit and stop orders to advanced orders such as good ‘til canceled (GTC). It doesn’t, however, allow margin trading, and compared to other advanced exchanges it lets users trade in only a small range of cryptocurrencies: bitcoin, bitcoin cash, litecoin, and ether. That said, it does give users the ability to trade their US dollars and euros directly for cryptocurrencies. Perhaps unsurprisingly for an exchange that’s paired with Coinbase, its security is generally very strong. 98% of customer cryptocurrency funds are held offline, while the 2% held online are insured, meaning that any customers who lost money as the result of a hack would receive full compensation. Added to this, the pairing with Coinbase provides an added degree of convenience and simplicity, in that users who’ve already registered and verified an account with Coinbase will have no need to do the same with Coinbase Pro. Security is another of Coinbase Pro’s strong points. As stated above, only 2% of its customers’ cryptocurrency funds are held online, and these are insured in the case of loss. Similarly, all deposits in US dollars are covered by FDIC insurance up to $250,000, while deposits in euros are still legally held in custodial accounts belonging to the customer, meaning that Coinbase Pro or its creditors couldn’t seize them in the unlikely event of the exchange’s collapse. Perhaps most reassuringly of all, Coinbase Pro has a registered BitLicense with the New York Department of Financial Services. This requires it to submit annual financial audits, which demonstrate that the exchange has sufficient liquidity and remains soundly managed. And while Coinbase Pro is still a relatively young exchange, it has never suffered any kind of hack. 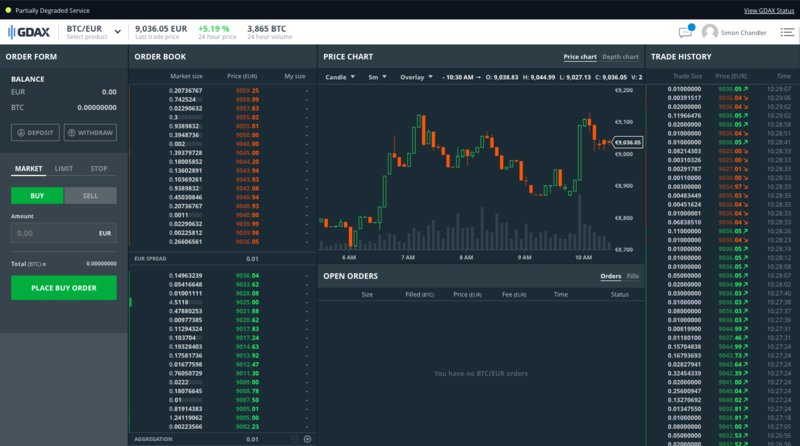 Coinbase Pro may be an exchange for professional traders, yet it’s one of the most usable and easiest to navigate. All the trading info a user needs is laid out on its dashboard, which is cleanly designed, responsive, and easily understood. Making trades is quick and painless, with the trading sidebar on the dashboard letting users choose and execute their desired trade with the click of a couple of buttons. Unfortunately, a mobile app isn’t currently available, yet the platform is so well-arranged that it’s still possible to use it on a smartphone without much trouble. Perhaps the only significant downside to Coinbase Pro’s usability is its customer support. The platform’s support pages are informative enough, but the support team can sometimes take several days to respond to requests, especially during busy periods. That said, this is a common complaint with popular exchanges, and Coinbase Pro is certainly no worse than other platforms that have a reputation for being slow in supporting their customers, such as Kraken or HitBTC. Depositing funds into a Coinbase Pro account is generally straightforward. Euros can be deposited directly using a SEPA bank transfer, while US dollars can be deposited using a standard bank wire or via an ACH deposit. For UK customers, direct deposits in GBP aren’t currently possible, so they’ll have to make a deposit in euros and then exchange this for the equivalent in GBP. That said, Coinbase Pro’s linkage with Coinbase means that users with a Coinbase account can in fact deposit any fiat currencies (or cryptocurrencies) they have to Coinbase Pro without paying any fee. The same is essentially true of withdrawals, although in this case these are limited by Coinbase Pro’s daily withdrawal limit, which begins at $10,000. As for withdrawals of fiat currencies into bank accounts, these work in the same way as deposits. Euros can once again be withdrawn using a SEPA transfer, which take one to two days to complete. US dollars can be withdrawn using an ACH transfer or a bank wire, while withdrawals in British pounds aren’t possible. And while fiat currency deposits and withdrawals are limited to some degree, users can deposit and withdraw all the cryptocurrencies traded on Coinbase Pro. All they need is an external wallet for each digital currency being traded.